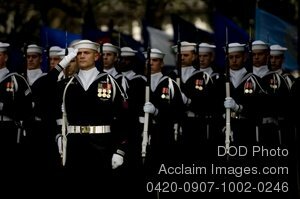 Description: Free, public domain image: United States Navy Ceremonial Guard Rendering Honors for Chief of Navy Operations. WASHINGTON (Oct. 11, 2007) - The Navy Ceremonial Guard renders honors during Chief of Naval Operations Adm. Gary Roughead's assumption of office ceremony at the Washington Navy Yard. Roughead relieved Adm. Mike Mullen as CNO on Sept. 29. U.S. Navy photo by Mass Communication Specialist 2nd Class Kevin S. O'Brien.